To make sure your embroidery project boasts a harmonious mix of complementary colors, try using a reliable embroidery thread conversion chart. These charts make the task of color conversion a quick and easy process. There are a couple of main reasons why an embroidery conversion chart is crucial to many patterns and styles. Sometimes, embroidery projects or designs use thread lots and embroidery supplies that are brand-specific, which means that a design created on a Brothers USA embroidery machine may feature floss that is different from a Bernina-designed embroidery project. Other times, people simply want to use their preferred brand of floss but need to do a conversion before they can proceed. Conversion charts allow all users to select similar and compatible colors from a variety of floss manufacturers, no matter which company originally designed the pattern. The complex business of floss color, threads, brand names, and conversion charts is a bit tricky for people who are just starting out in embroidery. The sections below offer detailed lists of all types of embroidery floss conversion charts and relevant information about how to find these charts. Fortunately, many of the companies that manufacture or distribute embroidery machines and accessories like floss understand that consumers need a way to perform thread conversions. To supply the demand and retain loyal customers, most manufacturers provide access to color charts right on their websites. Even when the sites don't supply an actual embroidery thread conversion chart, many include descriptive color information with images so that users can compare different thread varieties on their own. Brother USA: Even though there aren't any conversions, the Brother color chart lists each of their embroidery threads with an image, lot number, and brief description. Robison-Anton: Robison provides consumers with thread and color lists, as well as a color comparison/conversion form. The great thing about the Internet is that someone else has needed to convert embroidery thread at one time or another and is happy to share her resources online. 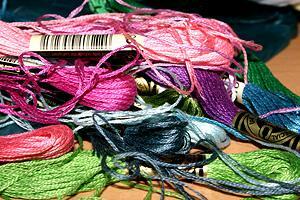 The links below provide conversion charts for all of the top brands of embroidery thread. Needlepointers: Thanks to the broad-reaching scope of the charts here, you may never need to search again. Thread conversions include Madeira, Brother, Baby Lock, Sulky, Isacord, and Sylko. Red Rock Thread: This site offers seven thread conversion charts for Robison-Anton, Madeira, Isacord, and Sulky. Embroidery Thread Database: Rather than a chart, this site supplies a collaboration tool that allows users to input the color number from a specific brand and then view matches to other brands. In recent years, embroidery as a hobby and an art form has become more popular than ever. With modern tools such as an embroidery thread conversion charts or software, anyone can stitch the embroidery patterns and designs currently on the market. Rediscover the allure of embroidery!